The extraordinarily simple-yet-fun and addictive electronic tennis game where two players rotate knobs controlling the vertical movement of their paddles, to bop a digital ball back and forth, was a historic mega-hit that kick-started the video game industry and defined its space in pop-culture history. As simple as the game may be by today’s standards, the history of Pong is littered with struggle and controversy. As the tagline goes "In the Beginning there was Pong", making many to believe that Pong was the very first video game, but in fact numerous gaming innovations that predate it, starting with the tech demo Tennis for Two (1958), the PDP computer labs shooter Spacewar!, the first coin-op arcade games Computer Space and Atari founders Nolan Bushnell and Ted Dabney first game title Galaxy Game (1971) (both of which were clones of Spacewar!) and lets not forget the 1972 Magnavox Odyssey, the first home video game console. Galaxy Game was manufactured and distributed by Nutting Associates and saw a modest success. This spurned Nolan Bushnell and Ted Dabney to break out on there own, so they formed their first company Syzygy Engineering, which later changed to Atari due to a trademark conflict. With intentions of designing and releasing their very own games the first thing they needed was a staff, so they hired First they needed a staff, was off an running as a growing company, and it needed a development team that went beyond founders Nolan Bushnell and Ted Dabney so they hired design engineer Al Alcorn, a former co-worker of Dabney. As a test, Bushnell and Dabney had Alcorn design and build a game based a demonstration Bushnell had seen of the upcoming Magnavox Odyssey. Alcorn went to work and blew everyone away with the results and it quickly went on the fast track to be Atari’s first arcade game. A coin-op arcade prototype of Pong was installed at a local bar called Andy Capp’s Tavern, and in a few weeks, it was stuffed with so many quarters that the game jammed up. After taking out a loan, Pong went into manufacturing and Atari Inc. was in business. In 1972, the same year Pong released to arcades, the Magnavox Odyssey launched as the very first home video game console. The system was a solid success, with interchangeable carts containing different games coupled with TV overlays and accessories such as cards and dice, and poker chips. After releasing a staggering number of Pong cabinets both domestic and abroad, as well as other arcade titles such as Space Race, Gotcha and Rebound, Atari was looking for its next venture. While they had clearly dominated arcades, they started eyeing the living room, whose only competition at the time came from the Odyssey. In 1974 Atari signed a deal with Sears to release the first home version of Pong. Instead of carts or cartridges, the system was a dedicated console, meaning that the game was self-contained within the unit. The system was first released as Sear Tele-Games and caught on instantly, becoming the department stores hottest selling item for Christmas, with sales eclipsing that of the Magnavox Odyssey. A year after Pong dominated the holiday season, Magnavox filled a lawsuit against Atari for infringing on their “exclusive rights”. Basically, Pong was quite similar in design and concept to Pong, and with the proof that Bushnell was one of the attendees at the Magnavox Odyssey demo, they ended up settling out of court. 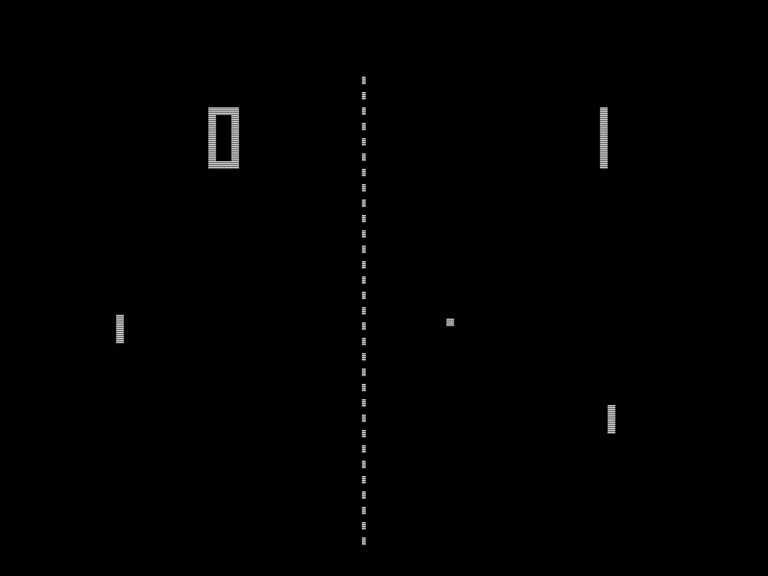 While Pong was similar in gameplay and structure to the Magnavox Odyssey, it had quite a different design and gameplay. The Odyssey’s display featured two square boxes bopping the third box back and forth for the majority of their games, however, those boxes that represented the paddle (or requite) could not only move up and down but left and right thanks to a two knobbed controller. Pong, on the other hand, used two flat paddles that could only move up and down, bopping a circular sprite back and forth. Success grows imitators, and while Atari had built its empire on reimagining an idea, another company, General Instruments, sought to make a fortune by literally duplicating one. GI developed the infamous AY-3-8500 chip, which was an exact clone of Pong, and also contained several variations of the game. Soon any company who could pony up for the chip could manufacture and release their very own video game systems. Some of the most infamous Pong clones included Coleco’s Telstar and Nintendo’s very first video game system, Color TV Game 6. While it might not have been the most original game and certainly wasn’t the first video game, Pong is without a doubt, the most important game ever released. Its enormous commercial success kick-started the video game industry, from being a small niche market to a household must.